IT’S getting warmer in the northern hemisphere as summer approaches, which means that this is the best time of year for hopeful migrants trying to cross the Mediterranean Sea and reach Europe’s shores. If the trends of the past three years are anything to go by, we could expect that by August, at least 116,000 mostly African migrants would have been apprehended this year, attempting to make the crossing from Libya and Egypt to Italy. 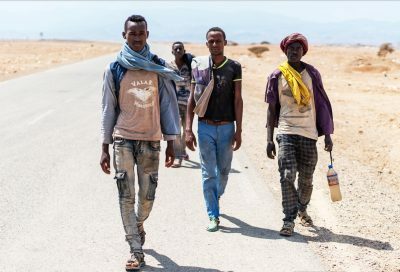 But this year may be different, because of a recent deal signed early April in Italy with the Toubou and Awlad Sulaiman tribes operating along the southern Libyan smuggling routes, which, it is hoped, will stem the flow of African migrants northward. The deal will see Libyan border guards active all across the country’s 5,000km southern border, as well as Libyan coast guards – trained and funded by Italy – step up sea patrols. A new report by the Africa-FRONTEX Intelligence Community reveals the intricate smuggling networks that drive irregular migrations across the Sahara desert, and onto flimsy rubber dinghies or dilapidated boats headed for Europe. Niger is the main transit country for large-scale smuggling across the Sahara desert towards North Africa, the report states. The city of Agadez, in particular, is the most important hub for West African migrants, with numerous well-organised networks in the city that provide the infrastructure and facilitation services for making the transit. 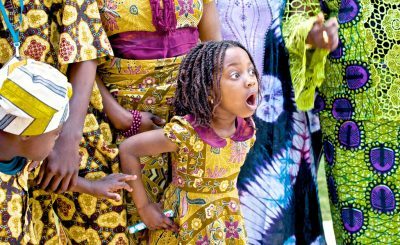 Most West African migrants come from Nigeria, the Gambia, Burkina Faso, Mali, Senegal, and Cote d’Ivoire. The moment migrants arrive at the bus station in Agadez, having travelled there on a legal, ordinary cross-country bus, they become part of a vibrant smuggling economy. 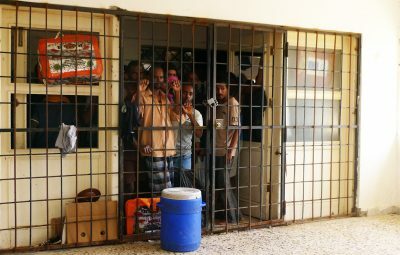 The city has numerous ghettos, which are mud walled and gated compounds thatprovide migrants with housing, often based on their ethnicity and nationality. A boss, who typically owns one or more compounds where migrants are housed, runs each ghetto. If the migrant doesn’t already have a local contact, he or she will be met by a bustling mob of ‘chasseurs’ at Agadez bus station — facilitators who attempt to recruit arriving migrants into the compound of their boss from the bus station, and get a small commission for each migrant they bring in. 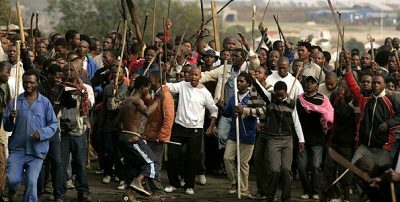 The ghetto boss also often owns a fleet of vehicles (either stolen or purchased) to transport the migrants; the vehicles are typically white Toyota Hilux trucks or military-style cargo trucks from Libya. 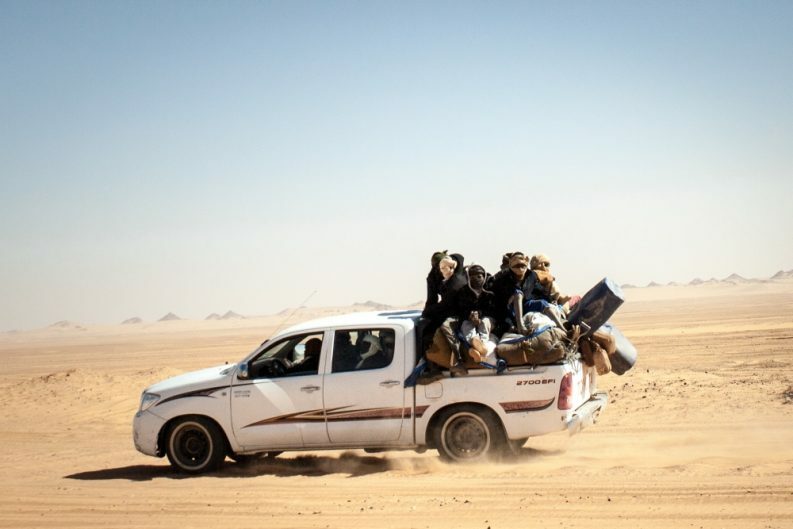 Once there are enough migrants in one compound to fill a truck, the ghetto boss communicates with a driver to pick up a group and move to the border into southern Libya. The Touareg, Toubou and Arab nomads, who have lived in the Sahara for generations and have intimate knowledge of that treacherous landscape, ferry the migrants across the desert. Sometimes, the migrants are caught in the middle of fierce rivalry between the Touraeg and Toubou, who compete with each other for access to resources and control of smuggling routes. On the eastern route are migrants from Eritrea, Ethiopia, Somalia and Sudan. Khartoum in Sudan is the main transit hub for these migrants, whom will sometimes go on to join the desert smuggling networks in Libya. However, a good number of them will travel to Egypt, in order to depart African shoes from Alexandria. Aswan in southern Egypt is the main transit hub on the route from the Horn of Africa to Egypt. From Aswan migrants use public transport to reach Cairo. Once there, they contact smuggling networks who then take them to safe houses near Alexandria; from there they are transported to Italy by boat. Somali migrants who choose to reach Europe via the Eastern Mediterranean route travel more and more by air from Hargeisa in Somaliland or Mogadishu in Somalia, to Tehran (Iran) via Dubai (UAE), before reaching the Turkish border by car and crossing it on foot, with the assistance of Iranian smugglers. Once in Turkey, migrants reach Istanbul by public transport. When they get there, they use Turkish smuggling networks and sail to Greece and Italy. One ironic twist in the Mediterrean crossings, especially for those departing from Libyan shores, is that increased EU naval patrols have pushed intercept missions closer and closer to the Libyan coast. It means that today, the migrant boats, instead of having to cross 200 to 400 nautical miles, might only have to do a dozen miles. 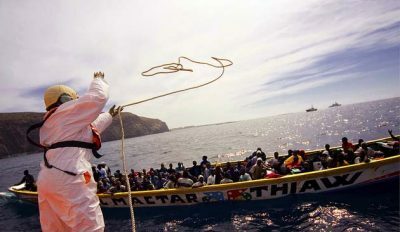 Once they cross from Libyan territorial waters and out into the open sea, they directly find boats from Operation Sophia waiting for them, which are obligated to take them to Europe’s shores. Indeed, the spike in attempted crossings began when an earlier search-and-rescue mission known as Mare Nostrum was put in place in 2013, which patrolled the Mediterrenean and responded to distress calls. But it soon emerged that search-and-rescue actually seemed to be inadvertently leading to more deaths– cynically, human traffickers responded to the patrols by packing even more migrants off, knowing that they would be rescued in case things go awry. 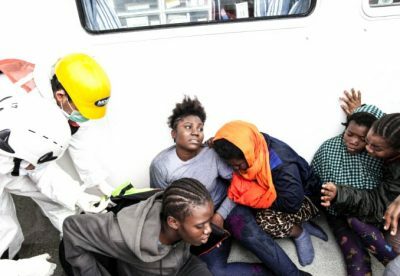 Mare Nostrum was replaced by Operation Sophia in 2015, but the unintended consequenceof search-and-rescue missions remains. With the average length of the sea voyage constantly decreasing, human smugglers now provide less fuel and basic supplies for the migrants to make it to Europe. The effect of this is that migrants are now transported on smaller, flimsier rubber dinghies, as the sea journey will last a day or two at most. With a smaller expense per journey, profits are getting higher. The average cost for a Somali migrant who would try to reach Italy via Alexandria is between $4,000 and 5,000, the report indicates. The Mediterrenean Sea crossing alone would set one back at least $2,000. With a shorter distance and lower expense, there is thus a greater incentive for overcrowding. The data shows that the average number of migrants per journey increased in 2016 to 324 per boat, up from 298 the previous year. Meanwhile, despite the massive irregular movements into the EU, the number of people effectively removed from the EU remained flat at around 15,500 on average per month between May 2015 and June 2016. In addition, the monthly figures did not show any rising trend at the beginning of 2016, when many of the migrants or asylum seekers who had arrived in 2015 would be eligible for return (due to a failed asylum claim or irregular stay). By doing this, it discourages the practice, said Seranno, quoted in Euronews. Migrant deaths are mainly related to overcrowding on the flimsy vessels. In some cases, the migrants attempt to take out the water leaking into the dinghy, which may lead to the accidental puncturing of the rubber and cause its deflating and sinking. Moreover, the wooden planks used to reinforce the floor of the rubber dinghies are so roughly cut that, on several overcrowded boats, they broke under the migrants weight and punctured the rubber causing the boat to sink.